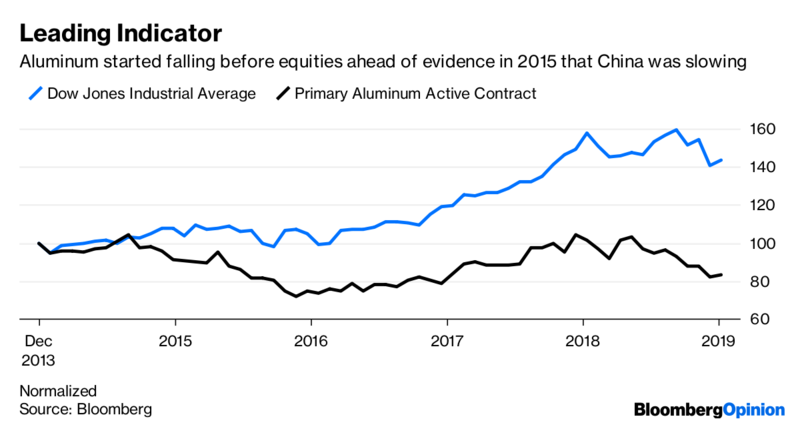 On the long list of leading indicators that market participants attempt to use to figure out where the economy may be headed, don’t overlook aluminum. Despite the many market-soothing words uttered by Federal Reserve Chairman Jerome Powell and former chairs Janet Yellen and Ben S. Bernanke at the American Economic Association’s annual meeting in Atlanta on Friday, economic and market risks have not vanished. 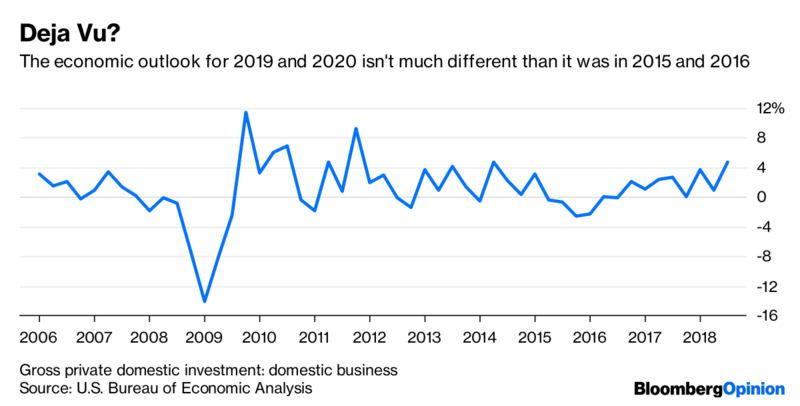 In fact, the risks for 2019 and 2020 look a lot like those in 2015 and 2016, when a Chinese manufacturing recession, depressed euro-zone manufacturing activity, and a U.S. business investment recession held back markets and growth. One of the most overlooked economic dynamics of the last five years is the Chinese manufacturing recession that lasted from December 2014 until June 2016. Now, China is on the edge of another manufacturing recession, following contractions in the December 2018 Caixin manufacturing PMI. This is just one of the major factors that raises the prospects of a 2015/2016 redux. Then, as now, aluminum led other markets lower, including oil prices, other industrial commodities and even equities. In fact, aluminum led markets in 2018 in a dynamic that we also saw during the drop in late 2014 to mid-2016 as well as the recovery-driven rise from mid-2016 until early 2018. One reason why aluminum is such a leading indicator is that China consumes a majority of the world’s aluminum. Not just a plurality, but an outright, albeit slight, majority of 54 percent. This means that aluminum is a more reliable read on China’s economic health than almost any other metric. And reliable Chinese growth metrics are in short supply. But China’s aluminum consumption isn’t the only reason the commodity’s a leader of markets. Aluminum consumption is heavily split between leading industries such as transport (27 percent), construction (25 percent) and equipment (9 percent). Although Powell noted the fall in copper prices, which is often referred to on Wall Street as “Dr. Copper” for its ability to track the global economy’s health, aluminum is arguably a better gauge of demand and growth, as supplies are not as tight worldwide and demand is more broadly distributed. Aluminum is arguably a better gauge of demand and growth, as supplies are not as tight worldwide and demand is more broadly distributed. 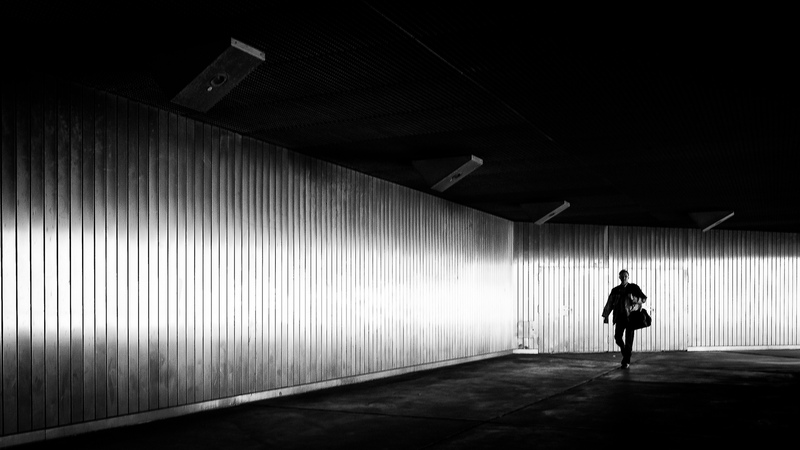 As an ominous forerunner of the risks ahead in 2019, LME aluminum prices suffered massive downward pressure in 2018, falling by 17.4 in a persistent downtrend throughout most of the year except during a brief period in April when U.S. sanctions on Russian aluminum giant United Co. Rusal triggered a short-lived spike in prices. The risk to industrial metals prices from a trade war — and the proxy implications for the global economy — was apparent in April, as I noted in a Bloomberg Opinion column at the time. Even if the Fed takes a more dovish turn, as Powell noted that policy makers are prepared to do, it would not end the trade war. And even if the trade war ends soon, which seems unlikely given that tariffs appear to be part of the pretext of a broader iceberg-like U.S.-China conflict, there is a lot of damage that’s been done. CEOs and supply chain professionals have been particularly vexed by the highly volatile trade dynamics, and businesses need stability to plan. Because without stability, planning is impossible. This threatens U.S. business investment in a higher interest rate environment in 2019 even if the Fed is on hold and even if the trade war ends quickly. The potential bright spot for growth in 2019 and 2020 is U.S. consumption, which as Yellen noted on Friday accounts for about two-thirds of U.S. gross domestic product. This seems like a reasonable expectation, since the U.S. consumer carried the day in 2015 and 2016. Of course, interest rates are a lot higher now, and the Fed keeps talking a hawkish game — no matter how dovish Powell sounded Friday. But with a strong labor market and strong consumption, there are limits to the weakness that we could see in the overall U.S. economy. And talk of a recession may be simply too bearish given that labor market dynamics are the best in decades. In any case, watching aluminum prices for signs of life and a light at the end of the economic tunnel of doom and gloom would be a wise strategy. Not just for aluminum — but for oil prices and equities.